Buy The Ginger People Gin Gins Double Strength Hard Candy - 84g in the UK from our online shop or directly from our independent Scottish store. These double strength hard ginger lollies are made with all natural ingredients and are a popular throat lozenge to both warm and soothe. Take Gin Gins Double Strength Hard Candy with you wherever you go and enjoy as a spicy-sweet pick-me-up. These double strength hard ginger lollies are made with all natural ingredients and are a popular throat lozenge to both warm and soothe. These ginger sweets are ideal for when travelling by car, boat, ferry or airplane. We sell real The Ginger People and other Sweets directly from our shop in Scotland and online throughout the UK. View more products from The Ginger People. Where can you buy real Gin Gins Hard Ginger Candy safely online? If you are wondering where you can buy The Ginger People Gin Gins Double Strength Hard Candy - 84g safely online in the UK, then shop with us. 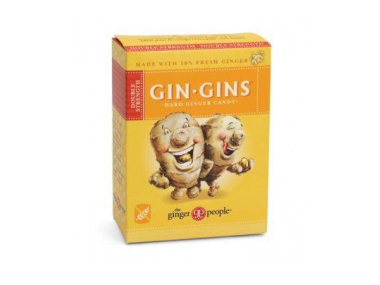 Gin Gins Hard Ginger Candy - The Ginger People Gin Gins Double Strength Hard Candy - 84g in Sweets and Confectionery.